Produktinformationen "3A X MARVEL PETER PARKER SPIDER-MAN 1/6 ACTIONFIGUR RETAIL EDITION"
From ThreeA. ThreeA proudly presents a special two-figure set that puts a signature Ashley Wood style towards one of the most widely recognized and beloved super-hero characters in the world: Spider-Man! Boy genius Peter Parker and his trusty remote controlled Spider-Bot are ready to hit the streets and take down crime. The fourth character in the ongoing Marvel x ThreeA 1/6-scale Figure series, Ashley Wood brings a unique take to the classic web-slinger motif, combining his fondness for robots and contemporary urban fashion together in this all new two-figure deluxe set. Spider-Man is fully articulated and features LED illuminated eyes, and Peter Parker comes with extras including: 4 Sets of interchangeable hands, Robot Controller accessory, Large cloth backpack, camera base body with a flash, light meter, dust blower and 4 interchangeable lenses. 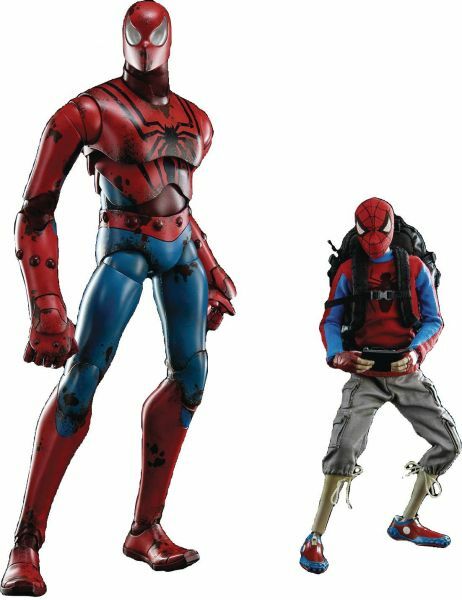 Weiterführende Links zu "3A X MARVEL PETER PARKER SPIDER-MAN 1/6 ACTIONFIGUR RETAIL EDITION"
Kundenbewertungen für "3A X MARVEL PETER PARKER SPIDER-MAN 1/6 ACTIONFIGUR RETAIL EDITION"